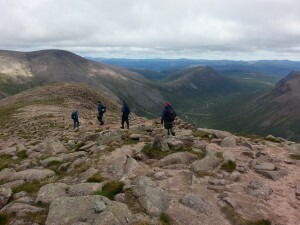 This is a 5 day introduction to mountaineering in a summer environmental conditions. The content includes navigation skills, clothing and equipment, access and conservation, mountain hazards, weather, camp craft and an overnight mountain expedition. The outcome is for the candidate to be a competent member of a group led by a qualified Summer Mountain Leader.